Various "peak and valley" varieties exist - see below. After the Fruit Trees (1991-1998) came only a set of 3 Stylized Maple Leafs (1999-2000) and a set of 3 Wildlife (2001). This was followed by a set of 3 Traditional Trades in Jan 2002. The die cutting of the self-adhesive coils consists of peaks and valleys with a flat area typically found between two adjacent rolls (miscut varieties are known where the flat area is entirely within a stamp). Does the stamp begin with a peak or a valley? Notice that whatever is found immediately after or immediately before the flat area is the same (ie. either a Peak or a Valley). 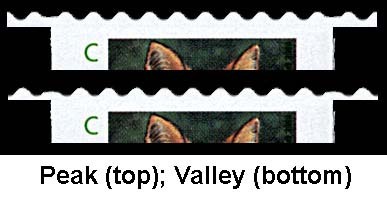 A "peak" stamp will have 10 peaks and 9 valleys on the top; a "valley" stamp will have 9 peaks and 10 valleys. A complete booklet panel clearly shows the flat area between two adjacent columns of stamps.